Some blog posts flow more easily than others. This one has been so difficult, full of starts and stops, delete delete delete. I guess I’m just searching for that perfect way to tell you about this book. So that I can convince you to read it. I’m not doing a very good job now am I? Maybe I should just let the book speak for itself. And so we meet Teza. He is a political prisoner in the “teak coffin” or solitary of a prison outside Rangoon. There is an air vent, high up on one wall, too high for Teza to look out. The rest is brick wall and the door. He has been in prison for nearly seven years, and he has thirteen more to go. Teza is forbidden to write or receive letters. And his only regular contact is Sein Yun the palm-reader, a fellow prisoner who works in the prison serving food and emptying latrine pails to reduce his sentence. Teza has nothing to do but stare at the walls and wait for his meals. He watches the ants that meander around his cell, watches the copper-pot spider in its web near the vent, and talks to himself. And there is also his “cheroot ceremony”. He hoards his cheroots, not to smoke them, but to unwrap them and read the fragments from the newspapers that they are made from. It is an image that stays with me long after I’ve finished the book. This desperation for words, for any hint of news from the outside world, even when these are words that don’t even make a sentence. He thinks of his mother who would read these news articles. For him these words, these fragments are so precious. Teza is in prison because of his songs of freedom, songs of protest that have echoed throughout Burma, songs written by a 25-year-old university student who could not comprehend what twenty years in solitary meant. As if solitary were not enough, Teza is tormented by junior jailer Handsome who tortures him, teases him, and seems to take the utmost pleasure in doing so. Tess’s previous jailer Chit Naing had been friendlier, and even visits him. Teza’s other friend is Little Brother, a 12-year-old orphan who has grown up inside the prison walls. He works in the cage for food and cheroots, and catches rats to sell to the prisoners. While he isn’t a prisoner, he has never really experienced life outside the cage before and is honestly terrified of the big wide world and all its uncertainties awaiting him. The two of them are thrown together when the most contraband of items – a pen – goes missing. Although most of the story takes place within the walls of the cage, Connelly’s novel is so vivid and evocative, resonating with the sounds and smells of Burma, through Teza’s memories and the daily motions of this harsh prison life. 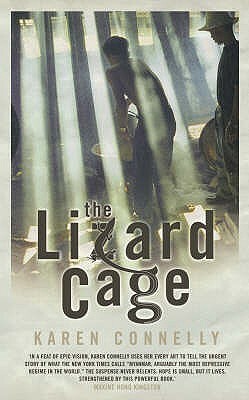 The Lizard Cage was such a moving, compelling read. It is serious and intense (sometimes too intense – I was clenching my fists when Teza was brutally beaten up) but it has such wonderful sweet moments. It is a reminder that our freedom (to walk around, to read, to eat whatever we’d like, to sing and listen to music, to believe…) is precious. I read this book for my personal challenge: Reading Southeast Asia in August. 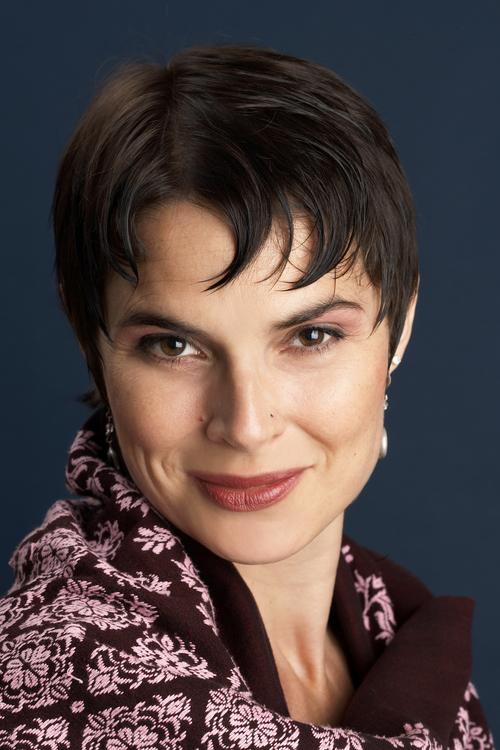 Karen Connelly is the author of nine books of best-selling nonfiction, fiction, and poetry, the most recent being Burmese Lessons, a love story, a memoir about her experiences in Burma and on the Thai-Burma border. 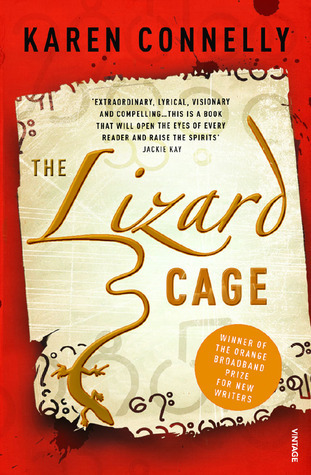 She has won the Pat Lowther Award for her poetry, the Governor General’s Award for her non-fiction, and Britain’s Orange Broadband Prize for New Fiction for her first novelThe Lizard Cage. 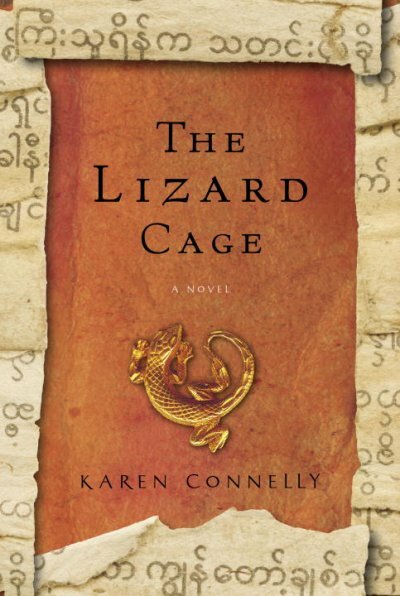 Published in 2005, The Lizard Cage was compared in the New York Times Book Review to the works of Orwell, Solzhenitsyn, and Mandela, and hailed in the Globe and Mail as “one of the best modern Canadian novels.” Her latest book, Burmese Lessons, was nominated for a Governor General’s Award and British Columbia National Award for Canadian Nonfiction in 2009. Next Post → Weekend Cooking: Mooncakes! I know how you feel, sometimes a book is so great that it’s intimidating to even begin to explain it! This book sounds incredible, I’ll definitely keep an eye out for it. Thanks for including the author bio too, great touch. Thanks Jayde for your very kind comment. I hope you manage to get hold of this book. It really deserves more readers! Thanks so much for stopping by and reading my review! And of course thank you for writing The Lizard Cage. It was one of my favourite reads of August – and possibly this year? And I really hope more people read it. I’m looking forward to reading your other books!